We take for granted most of the technology that surrounds us. 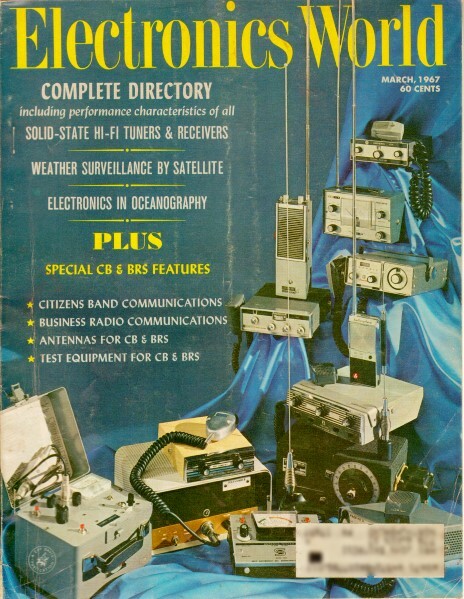 Unless you were alive 50 years ago at the dawn of microelectronics and space flight, it would be difficult to imagine a world without cellphones, desktop computers, color TVs, the Internet, and even satellite-base weather forecasting. Everyone likes to make jokes about weathermen being no better at predicting the weather than your grandmother's roomatiz[sic], but the fact is that, especially for short-term (2-3 days) predictions, we get pretty good information. As a model airplane flyer, I check the wind level forecast nearly every day to see whether my plane can handle it. AccuWeather's free hourly forecast is usually pretty darn accurate for today's and tomorrow's wind - to within a couple MPH. A plethora of ground reporting stations help improve accuracy, but data streamed from spaceborne instruments are the real key. This story in the 1967 Electronics World reports on some of the earlier imaging weather satellites. Amusingly, it also predicts the possibility of someday controlling world weather with the satellites' assistance. Tiros, Nimbus, and successor ESSA satellites are providing global weather information that may one day lead to global weather control. The new "cartwheel" Tiros photographs the earth as the satellite rolls along like a wheel in a near-polar orbit. To a great extent, man has learned to use the forces of nature beneficially. A notable exception is our inability to control those forces in nature which we know collectively as weather. Weather plays an important part in social and economic well-being of a nation. Agricultural output is strongly tied to the weather, as is the movement of ships at sea, aircraft, and land transport. Indeed, commerce as a whole depends to some degree on the behavior of the elements. In war as in peace, a nation's fate may be decided by the perversities of the weather. The defeat of the Spanish Armada, as well as the defeat of Napoleon's armies on the plains of Russia, were due in large measure to severe weather conditions. Until early 1960, meteorologists were somewhat earth-bound in their measurements of weather phenomena. True, aircraft and weather balloons were launched to measure wind speed, barometric pressure, and other weather variables. Later, sounding rockets were also used to obtain these measurements. But these measurements are somewhat localized in that only a small region of the atmosphere or stratosphere is sampled. And, as we know, weather is by no means predictable by immediate local conditions. A storm front in the far reaches of Canada's Hudson Bay on Tuesday can create havoc with cattle ranches in North Dakota on Thursday. Even with many remote weather stations positioned at strategic points around the world, severe weather conditions can be building up while unobserved by these stations. A system for weather surveillance which could survey large sectors of the earth was urgently needed. TThe Tiros (Television Infra-Red Observation Satellite) series provides a partial solution to this requirement. These vehicles, equipped with television cameras and infrared (IR) radiometers, gather data for analysis by meteorologists within hours after the observation. The first in the series, Tiros I, was launched from Cape Kennedy on April 1, 1960. At this writing, ten Tiros satellites have been launched. Table 1. Specs for Thor-Delta booster which launched Tiros. The iros is an 18-sided vehicle, 22 inches high by 42 inches in diameter, weighing about 300 pounds. Each of the 18 faces of the satellite is an array of solar cells. These 900 solar cells furnish charging current for the 63 nickel-cadmium cells which furnish power throughout orbit. Two 18·inch receiving antennas extend from the top of the satellite and are used to receive ground commands. Four 22-inch telemetry transmitting antennas are located on the underside of the package. Tiros I through VIII had two vidicon TV cameras mounted on the underside of the satellite. Later Tiros spacecraft have side-looking TV cameras mounted on opposite sides. This view of the Nile River and its Delta, the Red Sea, and the eastern Mediterranean was taken by Tiros III from an altitude of 400 miles. The Tiros series is put into orbit by the three-stage Thor­Delta launch vehicle. Table 1 gives important specifications for this space booster. For some perspective, recognize that jet engines used on modern commercial airliners have typical ratings of 16,000 pounds thrust per engine. Hence, the first stage alone of the launch vehicle delivers more thrust than ten of these aircraft engines. Launch vehicles have since been developed which generate more than two million. pounds of thrust. The vortex of the Hurricane Daisy photographed several year ago off the east coast of the United States by the Tiros V satellite. Tiros orbits range from 450 miles to 860 miles, with periods (time for one revolution) of 90 minutes to 113 minutes, respectively. At the 450-mile orbit a region on earth of 800 to 1000 miles in diameter is covered by one transmitted TV picture. 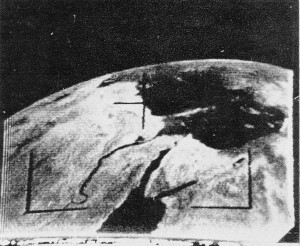 Tiros I through VIII were placed in a general east-west orbit, resulting in coverage of about 25% of the earth's surface. 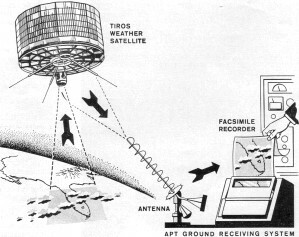 Later Tiros launches resulted in a north-south, or polar orbit. The polar orbit permits coverage of nearly all the earth's surface. The polar orbit is also selected so as to be nearly synchronous with the sun. The sun-sync orbit results in backlighting from the sun during the northward pass of the satellite, producing high-quality photographs. The Tiros VII being checked out prior to its launch into space. Tiros I-VII made use of a focal-plane shutter in conjunction with the two vidicon TV cameras. Pictures are stored on the tube face and converted to data bits for storage on magnetic tape or direct readout by ground stations. Each orbit results in 64 pictures, or 32 pictures per tape. Transmission of data to the ground station requires about three minutes. The data transmission simultaneously erases the magnetic tapes for the next data-gathering pass. The operation of the readout system as well as the timing of the picture-taking sequence is accomplished by ground command. The ground command sets timers which activate the camera system when the satellite passes over the region of interest. The APT ground receiving system uses fairly simple, inexpensive ground-based equipment which employs conventional facsimile recorder. Starting with Tiros VIII, a new system of data readout was used. The new system is designated Automatic Picture Transmission (APT). Rather than construct a TV picture line by line, electronically photograph the screen, and then store or transmit, APT uses a system similar to that used by newspapers and the press services to transmit photos. A facsimile recorder then reproduces the picture as received. Ground receiving stations for Tiros are Wallops Island, Virginia; San Nicolas, California; and Fairbanks, Alaska. Over-all direction of the Tiros system stems from Goddard Space Flight Center, Greenbelt, Maryland. These stations are capable of receiving data when the satellite draws to within 1500 miles of the station. 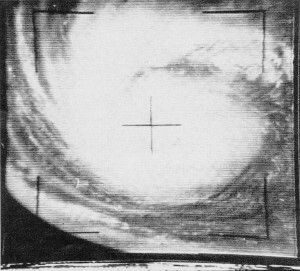 The received pictures are photographed by 35-mm camera for immediate analysis by meteorologists. In particular, these photos reveal conditions of cloud cover as well as the presence of hurricane conditions. In addition to the TV camera, infrared radiometers measure the amount of reflected and absorbed solar IR energy. The amount of IR energy absorbed and reflected determines the heat balance of the earth and therefore affects the weather. The IR data is transmitted and received as non-photographic data. This data is later reduced and plotted on weather maps for analysis. While the IR data is not immediately useful to meteorologists, it nevertheless provides a kind of long-range weather behavior of our planet. 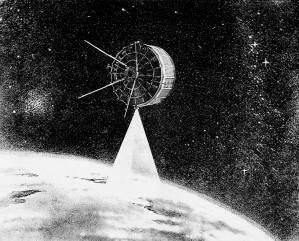 The initial design of Tiros called for a mission life of three to four months. The first Tiros was operational for 2 1/2 months. Later Tiros vehicles operated for well over one year. In the first three years of operation some 300,000 TV photographs were transmitted. Tiros I completed 1302 orbits and relayed 22,592 pictures to ground stations. As seen in the accompanying photographs, Tiros has produced some startling results. Of particular importance were other photos taken by Tiros III in Sept. 1961. These photos revealed the build-up of Hurricane Carla. As a result of this early warning, approximately 350,000 persons withdrew from the storm region involved and injuries and loss of life were held to an absolute minimum. In addition to the ten Tiros launchings, two each ESSA (Environmental Survey Satellite) and the Nimbus satellites that have been orbited. 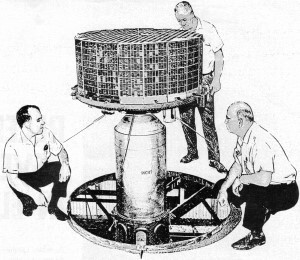 The ESSA satellites are similar to the earlier Tiros systems and operate in the "cartwheel" mode. ESSA I was launched on February 3, 1966 and carried two half-inch vidicon TV cameras into a circular 460-mile-high polar orbit, having a period of about 100 minutes. ESSA II carried two APT cameras into a circular 860-mile-high polar orbit with a 113-minute period. NASA plans to keep two ESSA satellites in orbit at all times. As one ESSA vehicle ceases to transmit, a replacement will be launched. The ESSA satellites represent the operational system for which the Tiros vehicles were the research and development packages. The Nimbus represents a more sophisticated weather satellite system. In particular, Nimbus is not restricted to photographing the earth during daylight. By means of its high-resolution red radiometer (HRIR) system, night photos are obtained. These photos appears as dark or light regions, depending on whether more or less heat is radiated, respectively. In addition to the HRIR system, three vidicon cameras are used. From an orbit of 575 miles, resolution of one-half mile is possible. The APT system was also flown on the Nimbus. Nimbus I was moderately successful after launch on August 28, 1964. The second stage of the launch vehicle did not burn as long as required, resulting in an elliptical orbit of 252 miles perigee and 578 miles apogee, rather than the planned circular 575-mile orbit. The satellite transmitted many useful photos until a solar panel locked and was thus unable to track the sun. As a result, Nimbus I ceased on September 23, 1964. Nimbus II was successfully launched May 15, 1966, carrying HRIR, APT, and vidicon systems. NASA plans to launch a Nimbus satellite approximately every 18 months. These vehicles will serve to test new systems for improved weather observations . The Tiros vehicles and successors form the Tiros Operational System (TOS), which is a joint undertaking of the U.S. Weather Bureau and NASA. In addition to the benefits already listed, the Tiros system may provide scientists with new insight into such phenomena as clear-air turbu­lence (CAT) and the nature of the "jet-stream." Perhaps history will someday show that Tiros provided a significant advance toward a goal we have desired, control of the weather. A system of sophisticated Tiros-like satellites, relaying weather data to a central computer which directs corrective (and as yet unknown) action to smooth the weather, is presently but a dream. But the translation from dream to design to hardware has been foreshortened considerably as our technology advances.